POS is the modern form of the Cash Registers kept at the cash counter of shops, restaurants and hotels. Till few years, the concept of chain retails, wholesales and restaurants were not as popular as they are now. They had their own share of difficulties and confusion in managing the stock and data. Later when technology started booming, the concept of computerized billing came forward. Though people from the old school were reluctant initially to budge from their books and bills, technology succeeded in invading into the retail chain. With the internet getting so popular and common, the network of retail got easier to connect and manage. The POS software system is now the heart of the retail chains. POS is for Point of Sales, this software manages all operations in the actual point of sales which is a retail or wholesale shop. With most of the big players in the retail and wholesale chain adapting ERP, POS software has become a mandatory requirement for a retail & wholesale business. Though they work similarly, the POS software for wholesale differs slightly from the retail counterpart. The main difference is the integration with a warehouse system which is mandatory for a wholesale that deals with a huge quantity of items. For wholesale, sales is done by delivering the orders, whereas for retail the customer checks a product and decides to buy it when they visit the shop or store. Hence, the wholesale POS will have a facility to input bulk orders and the sale can be automated when the order is confirmed. When it comes to retail, the requirements differ slightly, for instance, the wholesale POS requires handling the huge volume of data and the retail POS needs to be quick and robust. The POS software for retail needs to be integrated with accounting and employees required for the wholesale counterpart too. The wholesale customers are usually regular customers who may not visit the store for a purchase. Depending on their rapport with the wholesaler, they send a rough requirement against which the wholesaler sends some samples. Once the samples and the rates are approved, the bulk order is confirmed. In retail, importance is given more for quick processing as the customers are not so regular and the requirement is immediate. POS software systems are integrated with a touch-enabled screen for data entry, a bar code reader, a bill printer, a cash register and a card reader or a swiping machine. All these equipment work together at the sales counter to effect the sale and print a bill. The back-end server installed at the store will have options for stock entry, employee attendance, customer data and for managing other administrative jobs such as system backups. Earlier, every retail store required to have a client installation of the ERP software and daily batch updates would be made to the main server. This required each store to maintain a server, an administrator and a network administrator to manage the server and data network. System upgrades were very tedious, as each store in the retail chain has to be compliant with the changes for the batch updates to work accurately. With cloud ERP, this major issue has been effectively resolved. The workstations are connected to the cloud ERP which processes the bills and the data is centralized, simplifying the purchasing process. The management can easily find out the stores that are faring well and those not. Any discrepancies can be recognized and sorted out easily. With cloud ERP getting more popular, mobile ERP has also gained attention. The POS software can be compatible with a tablet or a mobile device which can access the cloud ERP to fetch and post the sales data. Implementation cost for cloud ERP is lower than on-premise ERP. 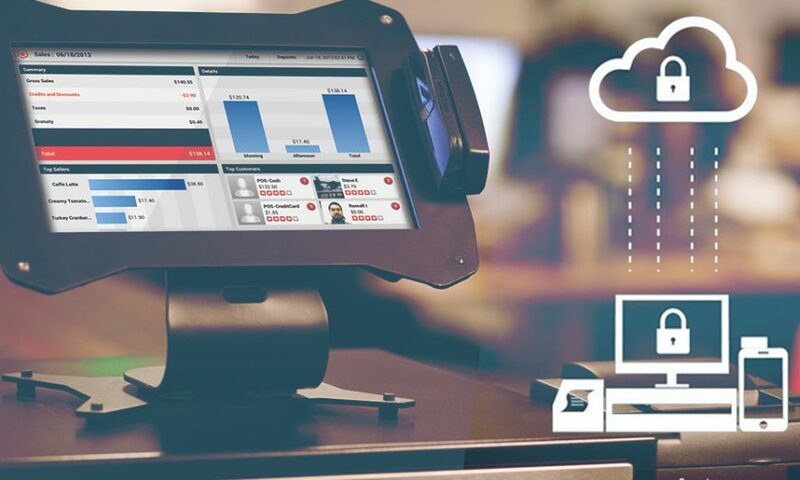 With cloud implementation, a mobile POS can also be set up. This is a very important aspect with the changing trends in sales. Mobile implementations will come handy with Kiosks, temporary stalls at fairs and exhibitions and when the client does a home to home sales as an introductory or marketing campaign. Inventory and customer data is stored centrally which can be accessed by the management and the stores to check on the stock levels. In case, a regular client request for a particular product which is not available in one store, the store can check the stock levels of the nearby store. If the nearby store has the stock, they can request for an internal transfer or request a reorder for the same item. This is possible only with data sharing across the various stores in the retail chain. Upgrades are easier to install in cloud ERP, without affecting the functioning of the retail stores, which is very important. Network data is a crucial factor in cloud ERPs. The retail chain needs to invest on a dedicated network for its chain of stores to connect to the cloud ERP or else the data retrieval, processing and storage can become extremely slow. If the billing becomes slow, customers will not wait. This is a big issue with cloud ERPs. If the cloud service provider has some issues it affects all the stores in billing. Data security is another major aspect to be checked while implementing cloud POS. In the case of an on-premise ERP, the transaction data is secured since the data is not shared. But cloud shares the data and hence requires high-level data security. What is shared depends on the type of cloud implementation chosen. In a SaaS implementation, the software is shared. In a PaaS cloud implementation, the platform is shared and in an IaaS cloud implementation, the infrastructure is shared. Switching cost also has to be considered while moving to cloud POS from the conventional system. For smaller retail chains it may not be very feasible to upgrade to the cloud. For large retail chains, the upgradation will be usually cost effective.